Nobody knows. The movie could come out this summer. It's not like Anno hasdn't done films in 2 years or less. Or it comes out in three years. Only Anno knows. Still, I'd say it seems like a good place to announce something due to the other stuff coming out. Seems like perfect hype building. The TV show being aired, an artbook collecting the last ten years of art plus a talk show. Btw, as I saw a few days ago in a message written by EvaMonkey on reddit, 1.0's release date was given less than two months before it came out. It's 100% impossible to predict anything, so I guess I'd rather be an optimist. I could see them giving us the official English title or the "color" of the movie. Note: Don't remember when it came out exactly but the original announcement trailer for Rebuild of Evangelion specifically said 1.0 was going to be released domestically in Japan on September 1st, 2007. I'm thinking this trailer came out in January of that year but 1.0 had a set release date way WAY earlier than 2 months. The release date could have even been given at the initial announcement back in August 2006 for all I can recall. This March date sounds good for something though. I can't speak to that because in 2006 I was 10 and didn't even know Evangelion was a thing lol. I'm still thinking the marketing will be unpredictable. I go back and forth between thinking white is the color or that it has yet to be revealed. The second 3.0 Groundwork book already used white as its color though (to differentiate it from the first, which was blue). I totally expect the title to be positive. Something like You can (not) give up. Or maybe You can (not) run away. (that would be a nice way to bookend it). Correct me if I'm wrong, but wasn't it announced that an external company would handle the film's marketing? I suppose these marketing people will still be khara staff right? robersora wrote: I could see them giving us the official English title or the "color" of the movie. It's white, or am I missing something? Gendo'sPapa wrote: Note: Don't remember when it came out exactly but the original announcement trailer for Rebuild of Evangelion specifically said 1.0 was going to be released domestically in Japan on September 1st, 2007. It was scheduled for "Summer 2007" when the Rebuild of Evangelion project was revealed, the September 1st release date was announced by Anno on February 14th. 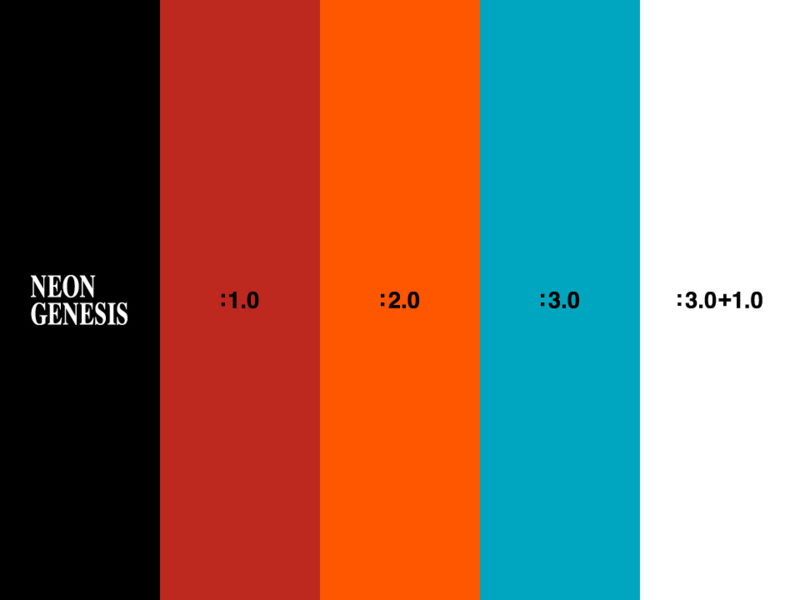 ∆ I like how NEON GENESIS and 3.0+1.0 are opposites in color. I'm trying to recall how the marketing for 3.0 went 5 years ago, did they start releasing those obscure piano 30second previews in the summer of 2012? Was that our first 'promotional material' for the 3rd film? It's been a while and my memory is hazy lol. Stan wrote: I'm trying to recall how the marketing for 3.0 went 5 years ago, did they start releasing those obscure piano 30second previews in the summer of 2012? Was that our first 'promotional material' for the 3rd film? It's been a while and my memory is hazy lol. Anno and Higuchi will appear as guest at Sukagawa International Short Film Festival for a talk about Giant God Warrior Appears in Tokyo. Joseki wrote: Anno and Higuchi will appear as guest at Sukagawa International Short Film Festival for a talk about Giant God Warrior Appears in Tokyo. April 1st in Japan, no Shin Eva news in sight. Looking at the positives: they didn't announce Shin Ultraman directed by Anno. Joseki wrote: April 1st in Japan, no Shin Eva news in sight. Not saying anything will happen, but its also 1:15AM in Tokyo as of this post, so I doubt any announcement would happen by now anyways. Hey, it's something at least. I don't think Anno cares about what is in theory the start of the business year though. That was probably Toho's decision with Shin. It also looks like AbemaTV has announced another run of NGE. At the rate they're going, they should just rename themselves EvaTV.